The military have always been at the forefront of innovation. Much of the development of the 19th and 20th century was associated with mobility, distance, speed and advantage that countries needed for logistical, security or military advantage. Just think about the development of aircraft during and since the First World War, GPS, wireless, nuclear power and even space flight. Many 'empires' are built on logistics in material and now data. It might not be surprising that wherever armies go, pay goes with them and a cashier provides them with currency for resources, rest and relaxation in foreign ports or lands. However, what about banking? The world's first mobile bank? The origins of the idea probably date from the Second World War, when army field cash offices administered payment and receipt of money to and from military units and individual soldiers. The United States army operated some of its pay offices from vans, and it was one of these vehicles, a Studebaker van serving US military personnel posted in Scotland, that the bank bought after the end of the war to convert into the first mobile bank. 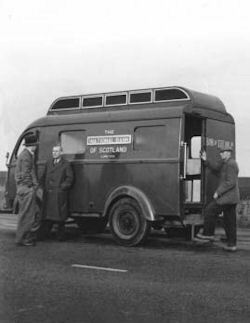 RBS constituent National Bank of Scotland introduced the world’s first mobile bank in November 1946. The National Bank of Scotland had an extensive network of branches spread over a wide geographical area. One operational problem it faced was how to provide banking facilities in remote areas, where the population was too scattered to warrant the establishment of a sub-office. Towards the end of 1946 the idea of introducing a ‘Travelling Bank’ on the Isle of Lewis was suggested to serve, in particular, the island’s crofter-weavers, who had to take significant time off work to visit the bank in Stornoway, the island’s biggest town. The idea was accepted, and the new mobile bank went into service on Tuesday 5 November 1946. Brought up to date, this operational solution could meet todays’ digital consumer habits. A growing network of mobile support will help our remote families get the best out of our digital capabilities. We won’t be like the old days but intend to use 'pop-ups' to enhance customer service and help them get the best out of our banking capabilities.